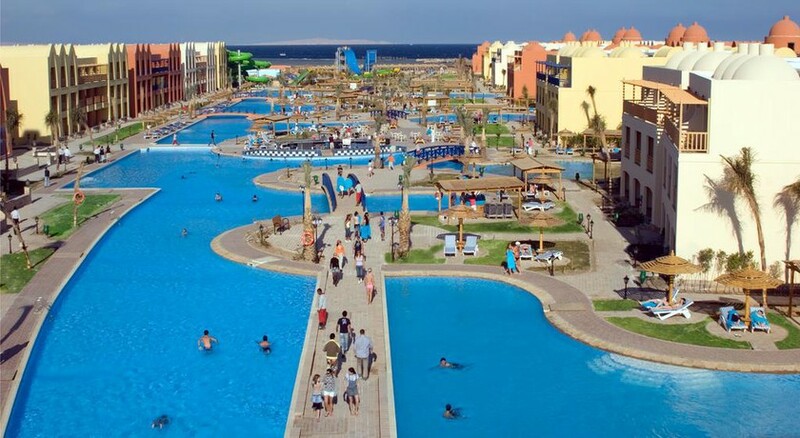 When it comes to luxury holidays in Hurghada, the Titanic Beach Spa & Aqua Park should be on the top of your list. 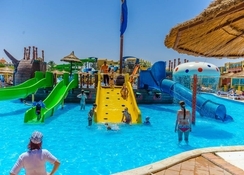 Lapped by the Red Sea on a gorgeous Egyptian coast, this family-friendly resort offers world-class facilities, including in-house waterpark, an outdoor pool and family entertainment. A place where you and your family can have some fun time in the large outdoor pool, which is split into three sections, or you can soak up some Egyptian rays on the terrace of your room. For a change in the scene, head to the hotel’s waterpark, one of biggest in Hurghada, and enjoy a fun-filled day on the waterslides. 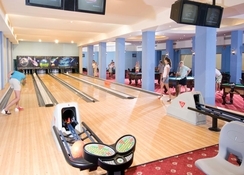 Additionally, there are a plethora of recreational activities in the hotel, including a gym, tennis courts and a spa. This all-inclusive resort offers an amazing gastronomic experience with four restaurants and four bars to choose from. And for your kids, the hotel has a mini-club and daytime activities to keep them happy and busy, whereas, fascinating nightly entertainment programmes for the whole family. 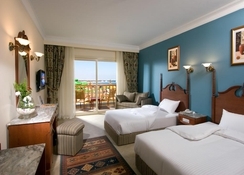 Situated on an exotic location in Hurghada, Titanic Beach Spa & Aqua Park is a fabulous family-friendly resort. The beach is right on the footsteps of the resort, meaning you have ample of sun, sand and sea. 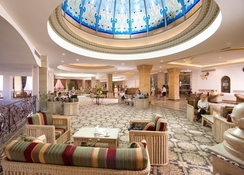 Hurghada city centre is 18km from the complex, brimming with shops, restaurants and bars. In case you want to try something extra, like an excursion to Cairo or Luxor and desert or sea safaris, the hotel provides shuttle bus service once a day. Other than soaking golden sunshine on the beach, try scuba diving and snorkelling and get up close to the marine life of the fabulous Red Sea. Hurghada International Airport is 15.5km and distance to Safaga is 43km. The resort has a wide range of dining options with three fabulous main restaurants featuring all-inclusive breakfast, lunch and dinner, and four amazing a la carte restaurants for Oriental, Italian and Chinese. Other than that, you have classy bars like Pirates lobby bar, the Captain's Inn Bar, Oasis pool bar, Sailor's Beach bar, Comfort Club VIP bar, Waves Disco for some lively evenings, and the elegant Titanic Ballroom for special events. All the 608 rooms of the resort come with a private terrace/balcony with sea or pool view, en-suites, temperature-controlled air conditioning, satellite TV with 12 channels, telephone, mini-fridge and hair dryer. The Double room category is perfect for families with kids and feature all the luxury facilities with an additional feature like safety deposit box. The Junior Suites as above come with a living area. And for large family accommodations (2 adults and 2-3 children or more), you can have a separate sleeping room connected to your room. Staying at the Titanic Beach Spa & Aqua Park, you’ve a wide range of activities to keep you busy. With sandy beach and the Red Sea right on your doorstep, soak up some sun or enjoy various watersports like snorkelling, diving and surfing, the choice is yours! The hotel features a huge outdoor pool, which is further divided in to three sections, safe for families and kids. The hotel boasts its waterpark where you with your family can enjoy a splash-tastic day out on the waterslides. With a gym, tennis courts and more, sports lovers have plentiful things to keep them engaged throughout their stay. And if you prefer a relaxing stay, treat yourself with a massage at hotel’s spa. Titanic Beach Spa & Aqua Park is offering ( WIFI ) service Free Of Charge in all hotel areas. Been here 4 times and keep coming back stunning hotel staff are great lovely and clean also loads to do for family’s only let down is animation team. Lovely resort. We went in December 2017. The weather was perfect. Resort facilities were amazing. The staff were really nice and friendly. We really enjoyed our stay at this resort. The resort itself is huge, and we were able to use the sister resort next door too. Definatley recommed this resort and would go to it again. Great value for money, good choice of food. I wouldn't pay for the wifi though, get a Vodafone SIM card and you can get plenty of data (8GB) for 100 EYP whereas the wifi is ~400 EYP for the week & it only works in reception. Rooms need updating. Food very bland . Needs to have more variety . Didn't enjoy the food in any restaurants in the hotel , was a let down . Hotel looks amazing, rooms good size and clean however complex was so busy that the staff did not have enough time to give you a good service unless you tipped them. Some staff were even rude! We have never experienced this in Egypt before. Sadly it happened in the year we brought some good friends of ours who had never been to Egypt and came because we boasted how friendly the people were! They will never go back. However on bright note we are going back this year just not to that hotel. Shame hotel looks fab from the outside!